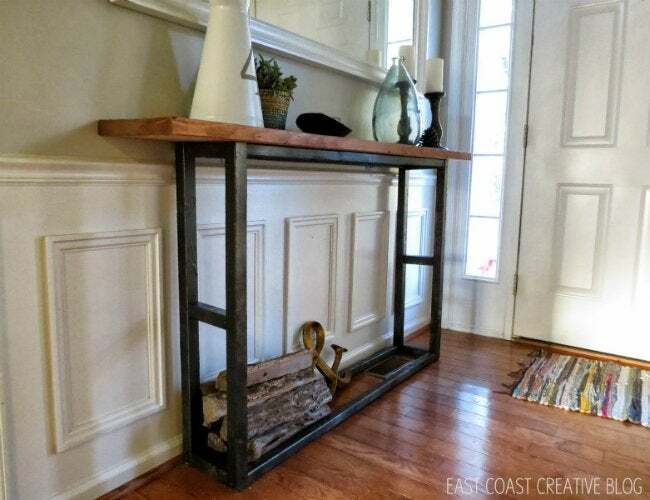 Get exactly the amount of counter space and storage you need when you DIY your own console table. 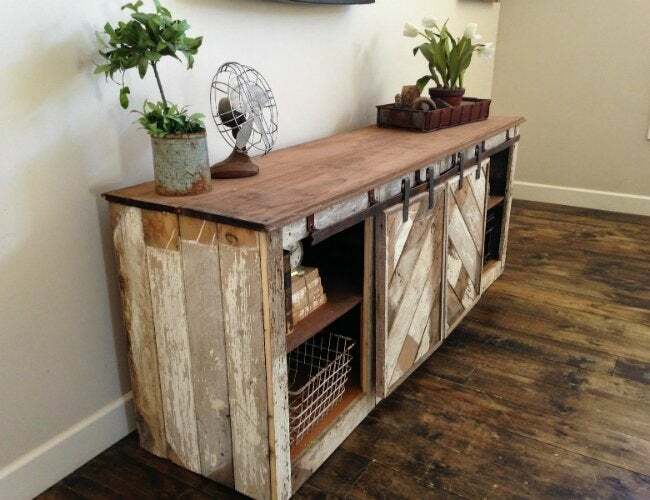 This adaptable piece of furniture is the perfect accent piece for any room in your home. Positioning a console table along a wall or sofa in the home can really reinvent the room, whether you use it as an accent piece in your entryway or additional storage for your TV and entertainment (the DVDs, the games, the cables, and more) in your living room. But finding one that suits your needs—and you’re your space’s dimensions—can be a challenge. You can’t get more custom (and affordable) than handmade, so we’ve rounded up five of our favorite plans to get you started. All you need is a weekend to put it together. 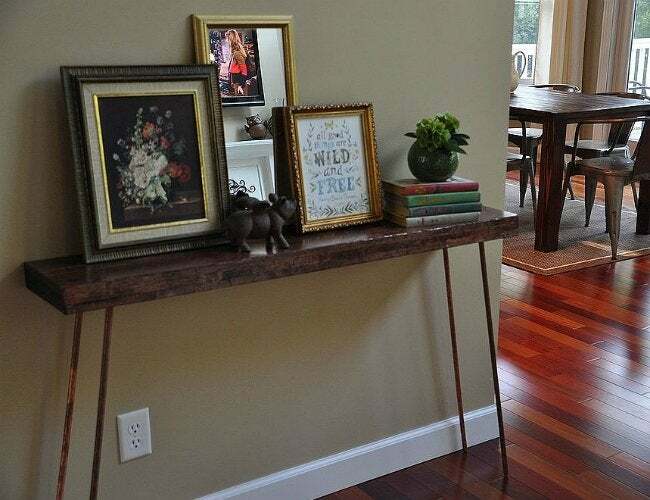 You might not believe it at first glance, but this narrow console table design—perfect for an entryway—is made entirely out of wood pieces. A closer look shows that the DIYer from East Coast Creative mimicked the look of steel on the base using several coats of bronze spray paint. A dark wood stain on the tabletop achieves a rich finish that perfectly compliments the sheen of the table legs. Equal parts décor and storage, this console table design from Ana White—with additional customization by interior designer Nikki Grandy—is a true workhorse for the home. After you build the wooden frame, pick up the sliding door hardware online or at your local hardware door; put in place, these will ensure that the doors on your console table seamlessly glide open and close whenever you need to reach your out-of-sight storage. 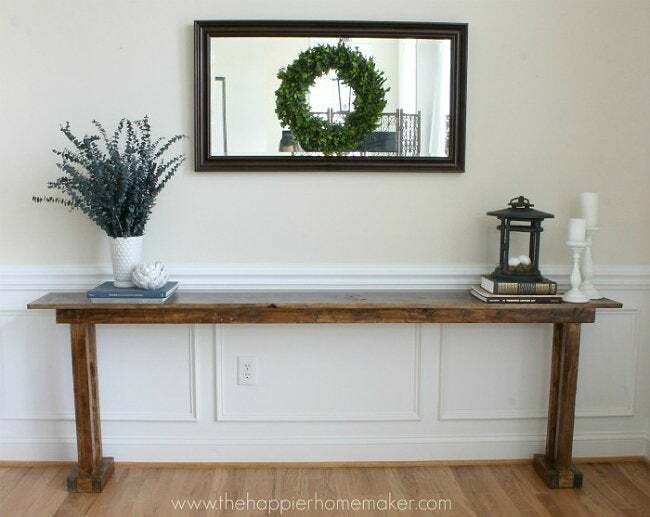 This clean wooden design from The Happier Homemaker lends itself to blending easily with almost any style, be it placed in an elegantly minimalist entryway or behind a brown leather sofa in a rustic living room. And as this blogger found out in the plan-as-you-go process of building it, its simplicity and length allows plenty of room for adaptation, depending on the space available. Inspired by an pricey piece in a Restoration Hardware catalog, this cheap and chic copycat from The Chronicles of Home is easy to replicate with the right tools. The blogger worked out the hard math for us: The trick to creating the hallmark X-base is cutting one end of each board at a 25-degree angle and the other, which meets at the cross-section, at a 65-degree angle. 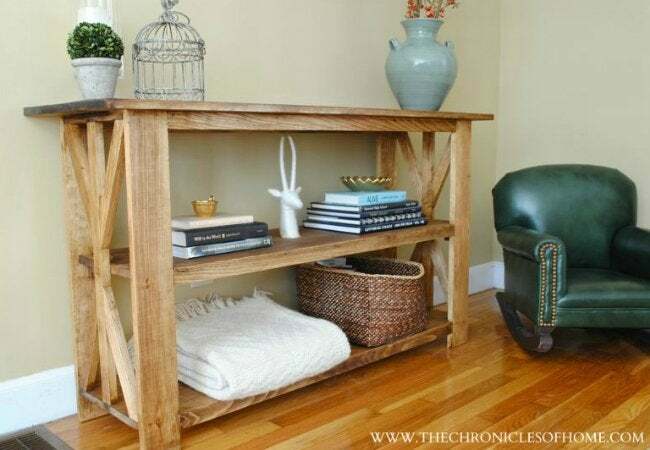 Stain all of your wood before assembling, and you’ll have a rustic unit with extra shelf storage wherever you set it. Probably the most defining feature to this industrial design from Décor and the Dog are the legs. No, this DIYer didn’t pick them up from a salvage yard; these come from a couple of 8-foot copper grounding rods, found in the electrical section at a hardware store. Talk about out-of-the-box thinking! Then, to instantly age a sturdy woodblock tabletop to match, she beat the boards with a hammer, crow bar, and screws before staining. Distress your own project in just a day, and you, too, can enjoy a one-of-a-kind entryway addition—and compliments from guests—for years to come.